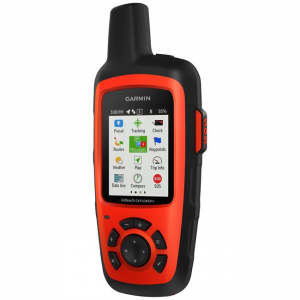 The Garmin inReach Explorer+ is a combination GPS tracker, navigation tool, 2-way satellite messenger and SOS device which gives you the ability to send and receive email messages and SMS messages via satellite, even when you are out of range of cell phone towers and wireless networks. It’s a big step up from the SPOT Gen 3 Satellite Messenger which lacks the two-way ad hoc text messaging, message confirmation, and navigation capabilities of the Garmin inReach Explorer+ Satellite Communicator. I know this firsthand. After using a SPOT for 8 years, I’ve switched to a Garmin inReach Explorer+. The inReach Explorer+ isn’t perfect, but it’s vastly superior to the SPOT Gen 3, even if you don’t use the entire range of capabilities provided by the inReach+ and just use it to text and communicate with loved ones via satellite. In the following review, I’ll explain the major benefits, weaknesses, and quirks of the Garmin inReach Explorer+ in addition to explaining the ins and outs and weakness of its different subscription pricing tiers. If you’re trying to decide between the Garmin inReach and the SPOT Gen 3 Satellite Communicator, I can also give you some insight into the why I switched from using a SPOT to a Garmin inReach Explorer+ and haven’t looked back. The Garmin inReach Explorer+ (weight 7.5 oz) provides fully interactive, two-way satellite based text messaging up to 160 characters in length. Preset (pre-defined) messages that you can edit and change in the inReach web portal. These are good for check-in’s or to tell someone you’re running late. Quick text messages (also pre-defined) that you can edit and change which obviate the need to type common responses when messaging back and forth with someone. SOS messages which are sent to Search and Rescue agencies when you activate the SOS capability. One of the best features on the inReach Explorer+ is audible or visual message confirmation. I’ve set up the Explorer+ to make an audible chirp when the message I’ve sent has been successfully relayed to the recipients email address or SMS cell phone number. That chirp sounds anywhere from 30 seconds to 10 minutes after I send a message, but knowing that it’s been sent and not lost (which occurs periodically with SPOTs) gives me enormous piece of mind. Quick text messages are used as shortcuts when messaging back and forth. You can change them to say anything you want. Those dropped messages are one of the main reasons I switched from a SPOT Gen 3 to an inReach Explorer+. With a SPOT, you never know whether your check-in messages are delivered. My wife likes me to check-in daily when I’m on backpacking trips in wilderness areas or overseas and she’d get really freaked out when she didn’t get my daily check-in messages because the SPOT messaging infrastructure dropped them. She is the person who I leave my trip plans with and would contact search and rescue if I became overdue. Keeping her up-to-date is a priority for me, even if I just send her predefined messages and GPS lat/lons with my current location once a day. The two-way text messaging capabilities of the inReach Explorer+ are even more useful in an emergency because you can communicate with rescuers while they’re en route, providing them with information about your condition and receiving instructions from them about how to stabilize your circumstances. Even more importantly, the two-way communication makes it possible for you to use the inReach to call-in emergency services for your hiking partner, guiding client, or a casualty that you come across during a hike, while assuring your family that you are not the victim yourself. You can’t do that with the SPOT satellite communicator or any other personal locator beacon sold today. There are two ways to activate the SOS function. The first is by pushing a button behind the hinged SOS door on the side of the inReach. The second is via the main menu, where you can add a custom message to the SOS request. Activating the SOS function on the inReach is simple but nearly impossible to do accidentally. The SOS button is hidden behind a small door on the side of the inReach that you need to open first to push it. You can also activate it from the main menu, but there is a countdown before the SOS is activated to make sure this was an intended action and not an accidental one. If you still manage to activate an SOS prematurely, you can cancel the SOS alert without requiring a SAR call-out by choosing the cancel SOS option on the two-way message history screen. Calling out a search and rescue team should always be avoided if you can rescue yourself. Many SAR personnel are volunteers and risk personal injury every time they leave for a mission. The Garmin inReach Explorer+ includes a weather forecast feature that lets you look up basic (free) or premium (detailed) forecast information. This is a great feature when you’re off the grid completely and need to avoid bad weather, especially in winter. The amount of detail provided in basic forecasts includes hour by hour break downs like those shown above, as well as wind speed, barometric pressure, wind chill value, cloud coverage, precipitation amounts, and temperature. You can request these forecasts for your current location or a distant one by typing in its GPS coordinates. It’s possible to track and share the track you take on a hike, using the inReach Explorer+ with another person in near real-time. This is handy if you want other people to be able to follow your track using the web-based inReach Mapshare capability, using a personalized URL that you send them when you start your trip. This tracking feature is also useful if you’ve missed a previously agreed-to check-in time because you’ve had an accident and can’t signal for help, since rescuers can follow your track to your current location. People who have your Mapshare URL can track you during a trip and see any waypoints you mark. This trip was from a trail patrol I did recently clearing out blowdowns in Franconia Notch. I marked the trees that I couldn’t clear myself that will require heavier equipment to remove. When tracking, you also need to define the send interval in which your logged track points are sent to the Garmin web site. If someone is following your route closely, you’ll want to set the sending interval to be more frequent. If you’re following a predefined route plan on a trail, a less frequent send interval is probably sufficient and will also extend the device’s battery life. The inReach route planning tool has some serious limitations and is significantly less featured than other web-based mapping tools like Caltopo or Garmin’s Basecamp. For example, you can’t extend a route if you accidentally finish one, you can’t generate a route profile, and the quality and currency of the digital maps provided is barely passable. You do however need to use the inReach planning tool if you want to synch and download routes to your inReach or export tracks of your trips. My advice would be to do all of your in-field GPS navigation, route tracking and waypoint marking with a separate GPS device if you own one already or a smartphone using the GAIA GPS navigation app. I believe that Garmin will eventually replace the inReach route planning tool with Garmin Basecamp, which is the existing GPS desktop route planning tool integrated with their GPS devices. You can display your track in the Earthmate smartphone app when it’s linked to your inReach with bluetooth. It is possible to see a topographic map of your route and track if you pair your inReach Explorer with Garmin’s free Earthmate iPhone or Android app via Bluetooth. The Earthmate mapping app can also be used to configure the Explorer device, send and receive text messages, and display data stored on it, providing a better interface than the clunky buttons and virtual keyboard on the Explorer device. But the Earthmate app is not best of breed when it comes to a smartphone GPS apps (like Gaia GPS). While you can download some additional maps to it and follow your GPS track in the Earthmate app, it’s best to think of it as an alternate front end that’s more convenient for messaging than the built-in inReach keyboard. The Garmin inReach Explorer+ has a built-in battery which must be recharged using a USB compatible power source or battery. Battery life is typically 4-5 days if you are careful about the tracking intervals you use, you keep the screen brightness at a low-level, you turn the device off at night, and configure the screen to automatically lock after a short interval. I consider having a USB rechargeable inReach battery a plus since I always carry a battery charger for recharging my cell phone, headlamp, and digital camera when I’m day hiking and backpacking. Garmin offers a number of subscription plans for the inReach Explorer+ users shown above, including discounted annual contracts and so-called Freedom Plans which let you upgrade or downgrade your inReach plan on a month-by-month basis. Annual plans require a 12-month contract. There is a one-time $19.95 subscription activation fee. Moving up a plan is free, and moving down a plan incurs a $24.95 fee. Freedom plans require a minimum 30-day commitment and you can move freely up and down a plan at no charge. When going up a plan, a minimum commitment of 30 days to the new plan is required. You can suspend your service on a monthly basis at no charge and still retain access to all your inReach data stored on the Explore portal. Your selected plan will auto-renew each month unless you make a change on your account in the Explore portal. There is an annual program fee of $24.95 to enroll in a Freedom plan. If you are just interested in using the inReach Explorer+ to send pre-canned text messages and SOS message, then the safety plan is quite affordable, particularly since you can tell when inReach messages have been delivered to their intended recipients (unlike the SPOT Gen 3 where messages periodically fail and no confirmation is provided). If you plan to travel internationally and want the ability to communicate with loved ones when you’re off the grid, then the Expedition plan is probably your best bet because you can send them an unlimited number of ad hoc messages. However, if you also want to use the tracking capabilities provided by the explorer, which are handy if you can’t send an SOS message because you are incapacitated or you want to create new GPS tracks by walking them, you need to upgrade to one of the more expensive plans which provide unlimited tracking points and tracking points logging at a faster. more accurate rate. The compass in the inReach Explorer+ provides the correct bearing even if you’re not moving. The Garmin inReach SE+ is slightly less expensive that the inReach Explorer+. What are the differences between the two units and is it worth buying the more expensive Explorer+ model? While having preloaded Topo maps on the Explorer+ does make it easier to navigate to a waypoint or backtrack because you can see what the terrain looks like between your current location and desired destination on the Explorer+ screen, they’re not strictly necessary if you’re using the SE+ with an additional dedicated GPS device or smartphone app like Gaia GPS to navigate. Net Net: If you’re a more experienced backcountry navigator and already use a dedicated GPS device or a smartphone navigation app, then the Garmin inReach SE+ is more than sufficient for your needs. But if you’re a more casual navigator without a desire or need to carry richer navigational tools, the Explorer+ is an easier to use, all-in-one solution than the SE+. 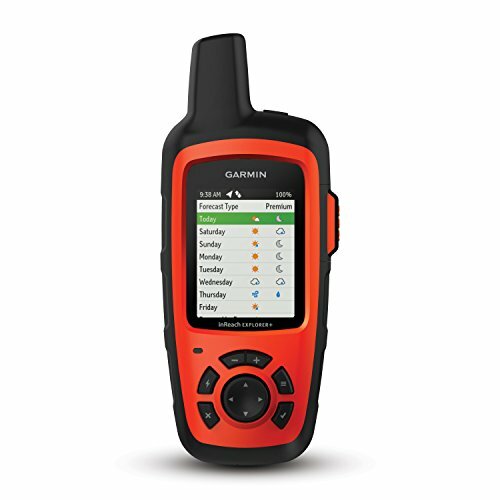 The Garmin inReach Explorer+ is a GPS tracker, navigation tool, 2-way satellite messenger and SOS device all in one. If you need a reliable way to send and receive text messages anywhere worldwide, the inReach Explorer+ has no equal. The Garmin inReach Explorer+ is a satellite communicator and GPS tracking device that can send and receive text messages, confirms message delivery, can send an SOS message for help, and track your route and GPS waypoints, even when you are out of range of cell phone towers. It beats the pants off of the SPOT Gen 3, in terms of message delivery reliability and the fact that you are not limited to pre-canned OK messages. While the satellite communication and SOS capabilities in the Explorer+ are superb, it’s not anywhere as sophisticated as Garmin’s dedicated GPS units. If you already own a Garmin GPS or navigate with a smartphone navigation app like Gaia GPS, I’d recommend getting the Garmin SE+ instead. If you’d like some basic graphical GPS capabilities, but don’t need the full range of maps available in more sophisticated tools or devices, than the inReach Explorer+ is a better choice. Digital compass does not have to be moving to display correct bearing. Web-based route planning app is rudimentary and not best of breed. Limited selection of topo maps available in the Earthmate app. Disclaimer: The author purchased this product with his own funds. Things I didn’t think I needed when I was an indestructible bachelor going solo, but now with middle-age, a concerned Mrs and disposable income, I would be an inconsiderate jerk if I didn’t check-in with a reliable technology tool. Aside from peace of mind, it’s a risk mitigation tool. Superior skill set and decades of wilderness experience is good, but earthquakes, rock slides, wildfires and unforeseen events are outside of my talent stack. Also lions and tigers and bears (oh my). I’m sold on the benefits. With what we dish out for cell phone and wireless connectivity, this is a pretty small price to pay to give loved ones peace of mind. What plan gives you 1 second tracking? Tracking on the rec plan with the SE (not +) is limited to ten minutes. Tracking and logging are different animals. You can log at 1 second intervals on any plan (at least on the Garmin models). Tracking refers to the interval in which the log points are sent up (in bursts) to the satellite. Thanks for the clarification. I think the issue then is that I have DeLorme hardware, not Garmin. I’ll doublecheck. Phillip, do you know the capacity of the battery? I was unable to find it anywhere, including the Garmin website. Everything lists expected discharge times, but unless you know the capacity you can’t predict how big your external charger needs to be. I carry an Anker 10000 mAh charger for my phone and it would be nice to estimate how many charges it would provide for the Garmin. I was looking for that information myself. The old one (previous version) was 2,450 mAh capacity at 3.7 V.
They say this one is bigger. That’s all. If you leave it on (non tracking mode) it discharges about 25% a day. I was an early adopter of the SE when it was first released a few years back. I have the safety plan pay year round whether I use the device or not. On the occasion that I exceed the ten texts per month, the overages are not expensive. If I were using it for commercial purposes then clearly a different plan would make more sense. I do not use it for navigation. I use it only for communication and weather. It is one of the best purchases I have ever made. Can you just put it in your pack or does it need to be clipped on the outside to work? I keep mine inside my pack, up near the top. I also use it inside my tent. Doesn’t affect the reception. This is not a review but an advertisement. Not sure how I should take that. I have a pretty good reputation in the industry for above board critical reviews. If you read through this post you’ll see that I’m fairly critical about the GPS navigation capabilities, the Earthmate app, and the poor map quality. I doubt you’d find that in an advertisement. Do you also carry a personal locator beacon such as ACR ResQlink or has your ability to transmit been sufficient you feel confident in the Garmin for emergency purposes? I have been reluctant to use SPOT because of stories where it has failed to deliver message or GPS coordinates have not been ideal. I’ve heard of failures with the ARC ResQlink too. Nothing is foolproof. The Garmin is pretty reliable in my experience. But I honestly count more on the person I leave my trip plan with and who will report me if I’m overdue. I check in with her twice a day, so she has a pretty good idea of where I’ll be more or less (within 10 miles) between check-ins. Excellent review, as usual, Philip. I’ve used the SE throughout this last summer/fall season when backpacking and backcountry tenkara fishing, etc. Peace of mind for myself and family/friends has been invaluable. I use Gaia GPS/CalTopo to navigate on my phone, so I just use the SE for messaging and emergencies. The SE and the plans have been so easy to manage. The first time I used it was my first day with it. I was solo backpacking and at the end of a long day, looking for a campsite. A young woman came tripping down the trail with a big grin on her face. “Hi, do you have a cell connection?” “Uh, hell no. But I have satellite connection. What’s up?” She had gotten lost and fallen near the top of a 14er here in Colorado. She had splayed open her arm on a sharp rock, and had stopped the bleeding with a bandana bandage. She was going to need a number of stitches, but was otherwise okay. She was most worried that she had been delayed several hours and that her father was going to call SAR. I was able to get a text to him telling her she was alright. Peace of mind! I have an older model InReach Explorer, which I bought about three years ago to enable communication as my brothers in law and I kayaked 83 miles of the Lower Canyons of the Rio Grande Wild and Scenic River on the Texas/Mexico border in the middle of winter. It’s about a 300 mile round trip to the takeout from where the wives would be camped and we wanted to let them know when and where we were safely camped each night and when to pick us up. I don’t have the unit handy at the moment so some of this will be from my quite imperfect memory–more on that high quality of recollection later. I think I had 3 canned messages I could send without customizing anything in the interface. One was a request for weather update that sent our GPS coordinates to the US Weather Service automated forecast site through a 3rd party that then sent back our weather outlook. The other two were “Camped for the night, all is well” and “We’ll be out tomorrow”, which was to be sent the night before we were planning to get to the take out and would be sent the next day if we ran behind schedule and required an additional night on the river. Of course, the imperfect memory set in and I forgot the unit in our RV and we didn’t have it on the river. We had to revert to Plan B, which was to have the wives pick us up on the 5th day, which they did, arriving an hour after we hit the take out. It’s a good thing we had that hour because it gave us a chance to clean up and change into some less grungy duds, otherwise they’d have turned around and drove off at the first sight, if not the first whiff of us. The InReach did come in very handy about a week later. A major ice storm had knocked out all the power in West Texas for several days and there was no power or gasoline available and we were stuck in Chisos Basin. My daughter, grandkids, and I set out to climb over Casa Grande, a very prominent mountain that overlooks the Basin. Through professional grade bad planning, I managed to accumulate a series of errors that culminated in our using the InReach Explorer to call for rescue. I got us on the trail late and since I hadn’t climbed that route in about 30 years, I forgot how difficult and exposed it is on the way up. I also didn’t take into account my daughter and granddaughter’s fear of heights and lack of stamina. We got way behind schedule but I didn’t want to backtrack the route we had come so I decided we’d go over the top and down the back side, which doesn’t have the amount of exposure the ascent does. In recollection, I should have bailed early and picked our way down back to the trailhead by traversing cross country, thus avoiding the sheerness of our ascent. We made the top and started down the back side when another bad decision kicked in–I forgot we’d have to work our way through trailless woods to get around to the back side of the mountain and it was now dark. We had headlights but I didn’t want to get out of the woods at the wrong spot. Somewhere en route, my daughter had twisted her ankle and it was really bothering her. After assessing our situation, I decided we needed to huddle up for protection and I should call for help so I sent an SOS from the Explorer. There was no place that wasn’t extremely steep so I propped us all up against a tree as best as possible and tried to wrap us up against the cold wind and dropping temps. More bad planning revealed I didn’t have a tarp with me to protect us all so I put the grandkids’ legs into my escape bivy and wrapped my daughter’s legs in my map to help shield her from the wind. We also used my daypack as more wind shelter. I hung a flashing light in the tree and we waited for the Rangers. Quite quickly, back and forth messaging let us know the Rangers were going to attempt a ground rescue by ascending the mountain the same route we’d climbed. I estimated they would clear the pass about 11 PM and right on time, I saw a light about a half mile away at the top of the pass. Other than my wife on our wedding day, that was the most beautiful thing I’d ever seen. They saw our light and were shortly checking us over. They wrapped us in warm sleeping bags, gave us hot drinks, taped my daughter’s ankle and we climbed back to the top of the pass, down some of the scary slopes and then traversed cross country (like I should have done a few hours earlier) and we made the trailhead at 5 AM. The text function on the InReach Explorer allows you to designate a number of recipients of your messages. I hadn’t thought to change them from what I’d set the previous week for the kayak trip and my whole family received a play by play of our all night predicament on Casa Grande. That’s another setting to watch out for if you use one of these things! All in all, I think the InReach Explorer is a very worthwhile piece of gear. Great review, Philip and thanks for clarifying the difference between tracking and logging. That is an important distinction. I have used a Garmin Oregon 400 for years, I love the ease of trip planning, built in topo, and track back features. I also carry a SPOT as by personal locator beacon. I have been hesitant about buying the InReach because I don’t believe the it performs as well as a GPS device as the Oregon. Obviously, the communication feature is huge but I really don’t want to carry two devices. 1) Does the InReach have a track back feature? It not, is there anyway to navigate back to where you came from by following your bread crumb trail? 2) Does the InReach have a “Find points of interest”? I often use that feature when hiking to find POI that are nearer or farther from my destination. I believe it will let you “find” waypoints only. 3) I believe you sync your phone via bluetooth to the InReach to make texting easier. Do you find this to be true? 4) Do you think the compass on the InReach is accurate. (I still carry an old fashioned compass but wanted your expert opinion. Thanks for this review and the level of detail. 1) has a go-to and creates a track. 2) not that I’m aware of. 3) You can use the earthmate app as a bluetooth device. is is easier Yes. Is it necessary. No. 4) It’s probably just using your phone’s compass. I use a regular analog compass. Faster. There’s no point in using the inreach to navigate when you can get much better maps and nav software in phone apps like Gaia or ViewRanger. I use them instead because you can use a third party web tool like Caltopo and import tracks into a phone (but not the inReach since the Earthmate app won’t import well formed Caltopo GPX files. While you can complicate your life by insisting on device-synching, it’s often more expedient to enter the contacts and messages manually. How many people do you really need to contact? Really – keep it simple and this device will do what you need it to do. I think Philip’s comments are spot on. I bought the older DeLorme for my son to take on his Appalachian Trail trip. He was able to send a preset “everything ok” message practically every night which was comforting to receive for my wife and me. Our two older sons then used it again on a canoe trip down the Mississippi with similar results. I take it with me whenever I go on a solo or winter hike. If used judiciously in the manner described above the minimum subscription is sufficient. I consider it primarily to be a communications device and agree that it doesn’t replace a GPS navigator since I found both the accuracy of the distance and altitude – not to mention the crude interface — to be lacking. G’day, updated from a PLB and would never go back. Brilliant re-assuring piece of kit. The preset to mobile phone AND email is just excellent. My daughters see my location on a map and can tap on reply to the SMS or the email and their message is back to me in a wink. Hearing that music when the message is sent is great. Superb. I have seen several tiger snakes (I am in Australia and just lately there seems to be a raft of bites and deaths due to the tiger snake) right up close and felt that little bit better with the SE model on SAFETY PLAN. Phil’s review was the last one I read before buying and it put me over the line. Ta Phil! I had to buy it in Australia tho’ due to Garmin. Glad it worked out. Thanks for the note. Great review. Looking to get the Explorer+ or the ResQLink mainly for emergency situations. 1) What is the SOS signal strength of the Explorer+ ? This is VERY important as we are in the woods a lot. I would never buy the SPOT (which is 0.4W compared to 5W for the ResQLink). 2) Is there a limit to the number of quick text messages one can define? We would be using the unit stand alone (vs synched with a phone) due to use in snow/freezing temps and not wanting to mess with syncing in the field and not wanting to be always synched due to battery drain. 3) is there significant additional battery drain on the Explorer+ and and iPhone 6 when continuously synched? 4) what is the battery life in SOS mode when the unit it transmitting SOS messages every 10-30min? 6) will the Explorer+ work if tucked in a jacket pocket or in a pack pocket? 7) the Explorer+ would be used as a backup navigation device. So can I set a short log interval to record the track but not transmit it (don’t want to pay extra with the Safety plan) and then be able to track back via these saved points? 2) check the manual. I never really use this feature. Too limiting. 6) yes, I keep mine in my pack. no issues. 7) I think so. Check the manual. I bought the Garmin Intreach Explorer + last summer because as a 72 year old female hiking alone on day hikes in the mountains near Seattle, my friends have fits. I’m not going to stop my solo hiking…I just don’t have someone else to hike with me…..so I bought the Garmin. Once I figured out all it’s idiosyncrasies, I love it. My friends can track me, I let them know when I’m leaving the trailhead and when I return back to the trailhead. Today I hiked 8 miles and it traced the trails beautifully. I’m not setting my own trails but hiking established trails. I’ve never had the Garmin come close to using all its power in one day. It recharges quickly and I carry a small recharger with me that has built in cables. My IPhone is a 7+ and I’m not only tracking but often listening to an Audible book as I tromp through the woods. Again no issues with use of power. I had one close call several months ago and did not have the Garmin with me. Made the mistake of having my son who lives in Hawaii on the phone at the time. He was having fits. That sure cured me of ever forgetting the Garmin. Yes, the subscription is a bit pricey but all it takes is one experience where it helps me out and it will have all been worth it. I got one for Christmas and am using the safety plan. It is great for being able to send preset “All is fine” messages at no cost or qty limitation, and preset messages include your location, so I send my starting location, another message anytime I’m deviating from planned course, and another when I’m back at the car. I also have a “I’m running late, will send an ‘all is fine’ message when I get back to the car” message. You can have up to three different preset messages. The weather forecasts are great while on 10 – 12 day backpack trips. I can watch the forecast and know when to bring my pack in at night. This summer when I head out on another 10 – 12 day trip, I’ll upgrade to get unlimited tracking points so people back at work can track my from their desks! Then when I get back, down grade back to the safety plan. My chief complaint is that the GPS tracking is not very accurate, in the Pacific Northwest anyways. The track points are all over the place with 75 foot to 150 “accuracy” being typical. Garmin even replaced my unit with a new one with the same results. I have tried 1 second, 15 second and 1 minute tracking intervals and will find that at 15 seconds a 4 mile snowshoe trip in steep terrain with trees will result in a track that says I went 13 miles. Typical hikes read usually about double my actual distance. For this reason, I also carry my Etrex 30 which is far more accurate and use it to track mileage and navigate. I can use the Explorer to navigate if needed, but unless it is wide open sky I have to use my Etrex, unfortunately. I had really hoped I could do it all with one. I am on my second year using the Spot Gen 3, mainly in Pennsyvania, where I live. It has performed well although I do wish I had the message comformation bleep you talk about…..just for piece of mind. I may upgrade to the In Reach the end of 2018 when my annual Spot subscription runs out and try to sell the Spot. Not only is there a message confirmation beep, but the message usually goes through in a minute or less. I usually have to wait 10 minutes for the spot to signal a send alone. I am getting ready to buy this (i’ll use your link), but I saw the price dropped. Although I like to save money, I wonder if the newer model (not the Mini) is about to be released. Have you heard? REI says it’s coming soon, but that’s all I know. It’s probably going to come after the sale is over, because REI usually does take pre-orders on gear that’s coming soon, and they’re not on the mini product. The Inreach explorer requires additional payment for weather information. It is not free. Basic payment is one text message and optional requires a fee. There is no keyboard so navigating the alphabet on screen with the thumb button is a pain, slower than heck and difficult to use. Messaging to any cell phone seems to work but replying to the message from the cell phone works then doesn’t work. Also, cell phone messaging can only be used for replying to a message received from the Inreach. You cannot arbitrarily text to the Inreach from a cell phone. Overall, the costs are astronomical. So far I have run up over $500 in billing for my Inreach. I bought the insurance plan but it only applies to the original owner and not to my wife that travels with me. So it cannot be loaned either. The Spot costs $150 and the subscription is $150 per year so it is much more economical. I have a Spot and have used it for years. My wife and I have traveled over 6,000 miles of trails in the Interior of Alaska in the last 12 years. We also have a mining claim 26 miles back by an ATV trail in the Granite Mts near Delta Junction. I take my Inreach Explorer+ with me every time I head out, even for a day hike. I’ve used it twice hiking the JMT to let my wife know I’m leaving camp and stopping for the day. I also use Gaia. When navigating, I find the Inreach is quicker to update my location than Gaia, which sometimes lags considerably (and annoyingly). However, there’s no doubt Gaia maps look better. One feature that should not be overlooked is that if you get off trail, the Inreach gives you a graphic pointing back to your route along with a heading to take. This has come in handy. One feature that I’ve found a waste of time is the weather forecast. If you look closely, you may note that the forecast is generalized for a 15 mile radius from your location (this may not always be the case?). Trying to use this to decide if I should start heading up Glen Pass with clouds gathering, I turned on Premium weather and was assured there was a 10% chance of rain. The rain hit halfway up, but at least there was no local lightning. I do realize I was in the back country, but when Accuweather can show you a MinuteCast, you’d like to think a paid service would do better than a 15 mile radius, which is pretty much worthless in the mountains.